Where will Skylab fall to Earth? After 34,981 trips around the world in six years, Skylab has done its duty and is ready to come back to Earth. At 77 tons, the research satellite is the biggest ever to fall out of orbit, but even bigger is the question of where, exactly, it will land upon re-entry. Journalists are studying orbital charts, but even the experts at NASA don't know where it will end up. As these back-to-back CBC-TV news reports show, there's a two per cent chance Skylab could break up over Canada. • A Saturn V rocket carried Skylab into space on May 14, 1973. It was an experimental space station that could function as a workshop for visiting astronauts, who travelled to and from it by Apollo rocket. Three crews of three men each occupied Skylab for a total of 171 days between its launch date and Feb. 8, 1974, with the third crew living in it for a record 84 days. • Skylab offered new opportunities for studying both the Earth and the sun, as well as testing the effects of microgravity on people. • Plans for Skylab originally called for it to remain in orbit until astronauts reaching space via the space shuttle could use it. But elevated solar activity spelled the end for Skylab, and it came plummeting to Earth before the space shuttle program got off the ground. • In the end, most of Skylab disappeared into the Indian Ocean off the western coast of Australia, although some debris landed near the towns of Esperance and Albany in the country's southwest. A witness said: "If you can imagine a train on fire with bits burning all the way down the carriages, that's what it was like. There were golds, yellows and reds. We were damn lucky to see it." Montreal native Julie Payette becomes the first Canadian to join an International Space Station mission. 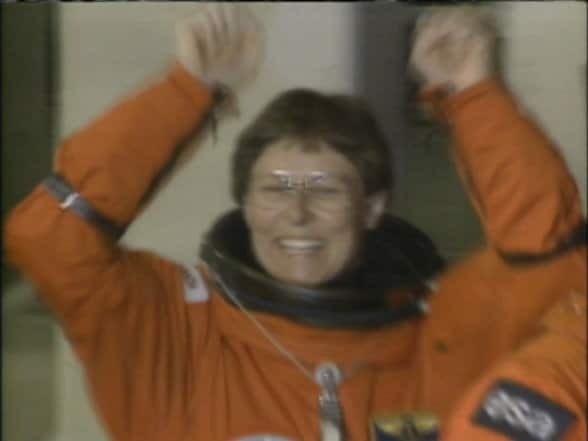 Dr. Bondar becomes the first Canadian woman and the second Canadian astronaut to take off for space. Astronomer and author Dr. Carl Sagan discusses the age-old question of whether there is intelligent life on other planets. NASA's first ever space shuttle makes a spectacular launch into orbit in 1981. Six civilians on a northern expedition find the debris of the satellite that fell to earth on Jan. 24, 1978. Cosmos 954 creates radioactive waste and political uproar. CBC reporter Lloyd Robertson visits Star City, home of the Soviet space program, in 1975. Would it be fun to be an astronaut? Razzle Dazzle asks: Do you think it would be fun and interesting to be an astronaut? Scientists discuss how we should look beyond our solar system for signs of intelligent life in 1965. When will we make it to Mars? When the Soviet Union sends a female cosmonaut into orbit in 1963, observers dismiss the achievement as a propaganda stunt.